Samaritan's Purse volunteers helped clean out more than 800 homes following the floods in Alberta in June. Through their work in High River, the team behind Samaritan’s Purse has found that sometimes it’s the small gestures that make the biggest impact. Reflecting on the last six months, Tim Neubauer, the relief organization’s case manager for High River, recalled a few poignant ideas to create moments of hope: a surprise birthday party for a resident living in Saddlebrook, art supplies for a local artist who lost everything or tracking down a dresser for someone who just needs a place to put their clothes. They’re small gestures that can give flood-affected residents the boost of resilience they need to continue rebuilding, said Neubauer. Samaritan’s Purse is an international Christian relief organization based in Calgary. It responds to disasters around the world and has deployed volunteer teams to respond to Typhoon Haiyan, Hurricane Katrina and the devastating 2010 earthquake in Haiti. Just over a week after the 2013 flood struck southern Alberta, Samaritan’s Purse set up a home base in Aldersyde to respond to needs in Calgary, Siksika Nation, High River and Black Diamond. In the months following the event, Samaritan’s Purse volunteers spent close to 20,000 hours working in hundreds of homes in High River. The organization shifted to the rebuild phase of their response in September and is now working alongside residents with unmet needs to help them get back into their homes or access resources to regain a sense of normalcy after the flood. 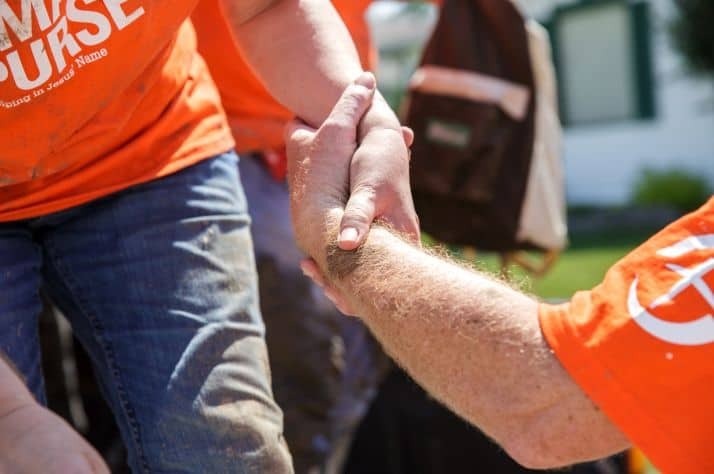 The organization has teams of volunteers and skilled trades people who can assist with a variety of home-restoration projects, from relocating heating and electrical systems to insulating basements and, in some cases, restoring homes from the ground up. In addition to volunteer labour, Samaritan’s Purse can also help to provide building materials where needed. But as Neubauer describes, their work has grown beyond construction projects to include supporting the community to restore resiliency and hope where they can. A major priority of Samaritan’s Purse is ensuring they work alongside High River residents by creating a relationship of support that’s sustainable and allows people to eventually continue rebuilding on their own, said Neubauer. Part of that comes down to working with local agencies, such as Alberta Health Services and the new High River Counselling Centre, that will exist in the community long term. The organization expects to be working in High River for at least another year and residents with unmet needs can reach out to Samaritan’s Purse for help at any time. If people are still unsure of the support they will receive from the Disaster Recovery Program (DRP) or insurance, they do not have to wait until they have all the answers to contact the organization to see if they qualify for help. Samaritan’s Purse is also looking at ways to create signs on hope for High River on a community-wide level and is hoping to introduce some new initiatives in the coming weeks. The hope is to create some visible symbols that will provide the community with reminders that efforts are moving forward.